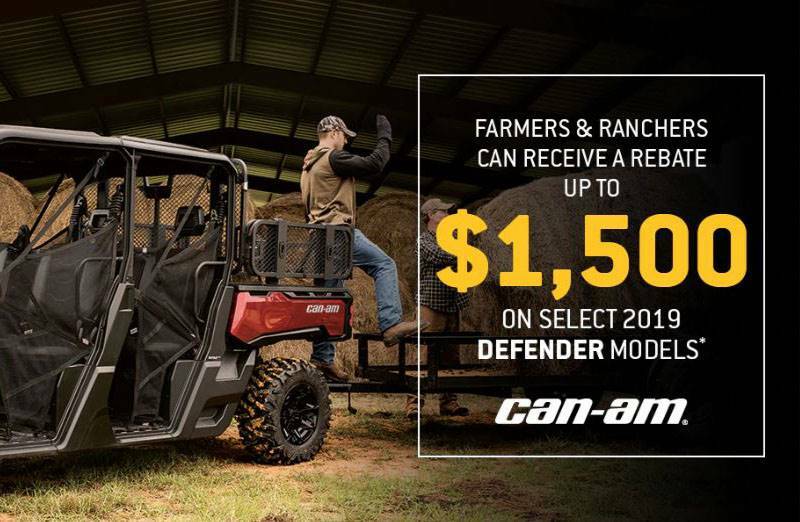 Take control with the Defender DPS that features comfortable Dynamic Power Steering (DPS), lightweight wheels and tires, adaptable storage, Visco Lok and more to make your job easier. HEAVY-DUTY ROTAX ENGINES: The 72 hp Rotax HD10 V Twin is specifically tuned for serious work but also offers 61 ft. lb. torque and peak torque at lower RPM for optimal delivery for recreational use. The Defender is now the sharpest tool in the shed. REINFORCED HEAFY-DUTY HSLA STEEL CHASSIS: The HD8 and HD10 Defenders can pull at the top of their class with a towing capacity of 2,500-lb. (1,134 kg). A reinforced, automotive-like high-strength, low-alloy (HSLA) grade steel chassis is purpose-built to handle the strain of heavy-duty jobs. From surviving Defender Challenge test drives to our brutal Utility Test Cycle, it’s clear we’ve built it tough for every situation you’ll face. DYNAMIC POWER STEERING: The specific Dynamic Power Steering (DPS) system is tuned for utility applications while also offering responsiveness for recreational usage. DPS improves steering feel in slow-speed working situations and in more technical terrain. It also is designed to offer less assistance at high speed and more assistance at low speed. 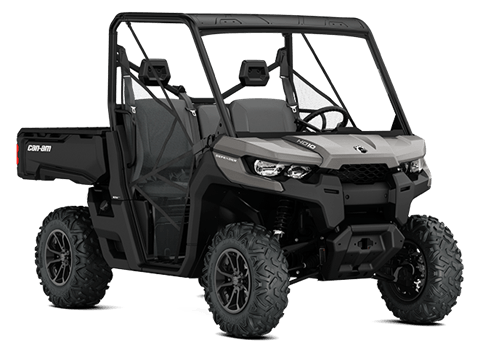 HEAVY-DUTY REAR SUSPENSION: The Defender heavy-duty Torsional Trailing A-arms (TTA) was designed specifically for utility and recreational usage, offers a full 10 in. (25.4 cm) of travel to provide a smooth ride whatever the terrain. Its architecture offers optimal comfort and drivability in all conditions thanks to no camber. VERSA-PRO BENCH SEAT: The VERSA-PRO Bench Seat is engineered as a 40/20/40 bench seat, inspired by modern pick-up trucks. It can comfortably accommodate three adults and features “profiled” corners to improve entrance / exit of the cab as well as a sturdy vinyl cover for improved wear resistance. The passenger seats, complete with integrated hooks on their underside, also can be flipped up to improve onboard storage. 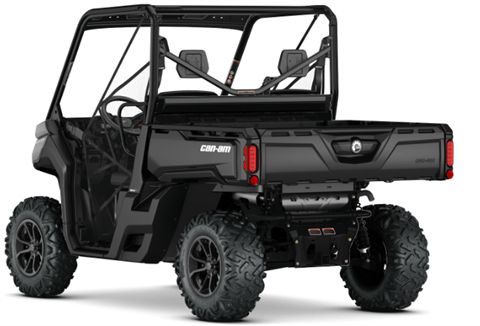 Can-Am designers also added a foldable central console and armrest with two cup holders to allow more space in the cab. OPEN DASH WITH REMOVABLE TOOLBOX AND UNDER DASH STORAGE: The open dash design features a handy removable and water-resistant 1.7 gal. (6.3 l) toolbox, an industry exclusive, to allow users to carefully carry tools and supplies their need in an organized manner. In addition, it includes 6 gal. (23 l) of under dash storage with an enclosed pocket, perfect for stowing small essentials. All in all, the Defender proposes a total of 10.4 gal. (39.5 l) of storage solutions. MULTIFUNCTION CARGO BOX WITH STURDY TAILGATE: The highly durable Cargo box has a 1,000 lb. (454 kg) load capacity and easily dumps. Strategic features include 5 gal. (18.9 l) pail recesses, integrated anchors on the sidewalls and several tie-down points for added convenience. To fully optimize the sizeable cargo box, consumers can divide up the box using the integrated recesses. The box allows for both 1 x 3 and plywood separators and accepts bed extenders for refining the bed’s overall dimensions. Also, the sturdy tailgate can withstand ordinary farm use and serve as a seat during your lunch break (max weight: 250 lb. / 113 kg). PROFILED CAGE: The sturdy Profile cage (steel) is designed in tandem with the Can-Am Cab and genuine accessories to ensure the best fit-and-finish and seamless integration in the industry. To enhance visibility and improve entrance / exit of the cab, the front section of the cage was moved far forward. LIGHTWEIGHT TIRES AND WHEELS: 14 in. (35.6 cm) black cast-aluminium wheels with 27 in. (68,6 cm) Maxxis Bighorn 2.0 tires. * Advertised price does not include: document fee, dealer freight charges, dealer preparation and assembly charges. Discounted prices are cash discounted prices and there may be additional charges if paying by a credit or debit card.